Location: Le Mesnil-Saint-Denis, in the Yvelines departement of France (Ile-de-France Region). 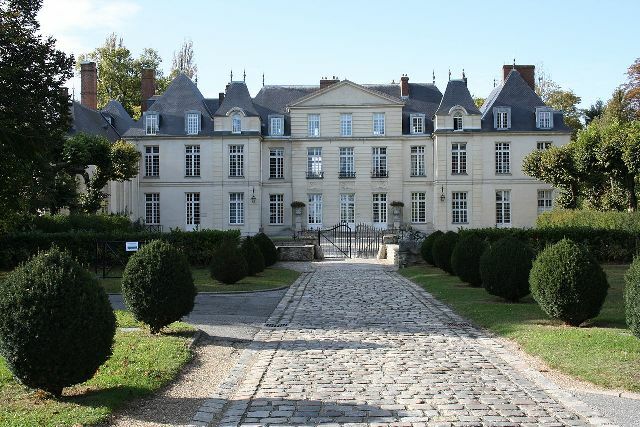 Notes: Château du Mesnil-Saint-Denis is a castle located in the town of Mesnil-Saint-Denis, in the Yvelines department.The castle was built in 1589 by Louis Habert de Montmort, Secretary of Finance Henry III and ordinary general treasurer wars. He passed to his grandson, son, Henri Louis Habert de Montmor, who passed it later to his son Jean Louis Habert de Montmort, Quartermaster General of the Galleys of France. His nephew, Jean-Louis Rieu's Fargis, inherited it in 1724. In 1737 it was acquired by Charles de Selle (1707-1786), State Councillor. The castle passed to the woman of letters Sophie Gay in 1842. It was acquired in 1865 by Adolphe Pierre Husson and his wife Pauline Carcenac (daughter of Henry Gustave Carcenac, mayor of the 2nd district of Paris). The Husson family-Carcenac fact restore the castle under the direction of architect Hippolyte Destailleur and there are a chapel built in 1884. Their daughter Marie-Adele-Alexandra-Carcenac Husson (in religion Sister Mary of the Nativity) is the founder of monastery of the Sacred Heart of Mesnil-Saint-Denis. Another of their daughter married the owner Fernand Crouan. The castle was occupied by Prussian troops commanded by Grand Duke Friedrich Franz II von Mecklenburg-Schwerin then by Frederick William Prince Hohenlohe during the Franco-Prussian War of 1870.It passes Norwegian Minister Fredrik Herman Gade (in) in 1929. King Zog of Albania 1 and Queen Geraldine, in exile reside there in 1940. Milton Reynolds (in) the Redeemed in 1947.The monument is the subject of a registration as a historic monument since 4 January 1947.In 1952 the castle was bought by the town of Mesnil-Saint-Denis to install the mayor and technical services.